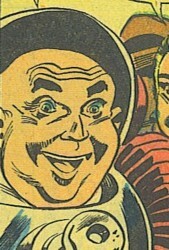 Powers/Abilities: Seeming to be just an eccentric middle-aged and portly man, the "Moon-Man" was actually a humanoid alien who displayed no paranormal abilities. He was tested and found to have fantastically high intelligence (by human standards), which was only average for his race, and he was a talented sketch-artist. Deemed to be mentally "unbalanced" by his people, the "Moon-Man" was confined to their Capel Sanitarium on Earth's moon for treatment. 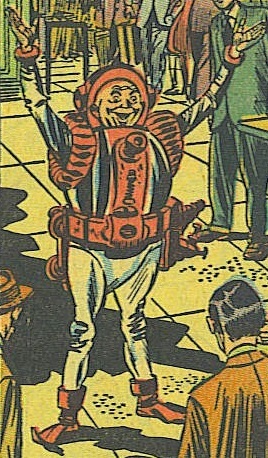 The "Moon-Man" wore an environmental-containment suit equipped with multiple devices, including a communication device he called a "sound-forcer". He traveled from the Moon to Earth in a "flying saucer" spacecraft. (Strange Tales I#42/3 (fb) - BTS) - Nothing is known of the past of the alien "Moon-Man," but he was considered to be "unbalanced" by his people, so he was confined to their Capel Sanitarium on Earth's Moon. One day he escaped, procured a spacecraft, and flew to Earth. He landed his "flying saucer" by a railroad track near New York's Grand Central Station--unknown to him, two sanitarium attendants were dispatched to apprehend him. 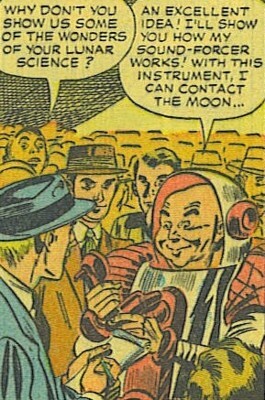 (Strange Tales I#42/3) - The "Moon-Man" entered Grand Central Station and announced his greetings to the people of Earth. The crowd thought him only to be part of a publicity stunt for some movie, but he caught the attention of a reporter. 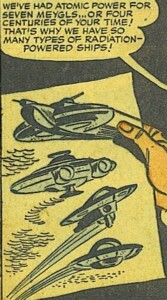 The reporter humored the chubby man and requested to see his "flying saucer," but after a half-hour of searching, the "Moon-Man" couldn't remember by which set of tracks he left it--the reporter doubted the veracity of the "Moon-Man's" claim, telling him that he thought the "Moon-Man" either came from a padded-cell or a publicity manager's office. But as a crowd began to gather, the reporter asked the "Moon-Man" to show them some of the wonders of his advanced lunar science. The "Moon-Man" was about to demonstrate his "sound-forcer," with which he could communicate with the Moon, but changed his mind, explaining that he was reluctant to do so for personal reasons. Then a cop walked up and and saw that the eccentric man was creating a public disturbance; but rather than taking him to jail, the cop told the "Moon-Man" that for the benefit of all concerned, he'd take him to a psychiatrist instead, and the reporter accompanied him. In the psychiatrist's office, while the reporter watched, the "Moon-Man" was tested by the doctor, and he was found to have a fantastically high intelligence--the "Moon-Man" contended that among his own people on the Moon, he was just average. The psychiatrist thought that his constant reference about coming from the Moon showed a strong obsessive tendency, so he asked the "Moon-Man" to tell him more about his home so that they might help to cure him of his delusion. 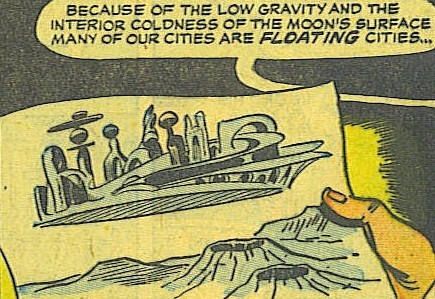 The "Moon-Man" insisted that it was no delusion, then he grabbed a pencil and pad of paper and proceeded to sketch drawings of his people's cities and spaceships. 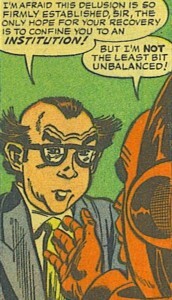 Exasperated, the psychiatrist concluded that the "Moon-Man" was too far separated from reality, and his only hope for recovery was to be confined in an institution, although the "Moon-Man" assured him he wasn't the least bit unbalanced. Just then, two men entered the psychiatrist's office, and they told the doctor that the "Moon-Man" was an escapee from their institution. The men showed the doctor and reporter their card, which indicated they were from the Capel Sanitarium--the psychiatrist admitted he'd never heard of the place, but one of the men mentioned that their institution was rather little known, and they handled cases that wanted to avoid publicity. The two men then took the "Moon-Man" into their custody. The next day, the reporter was again at the train station, and he learned of a puzzling discovery--a burned, mildly radioactive oval patch was found near one of the railroad tracks. 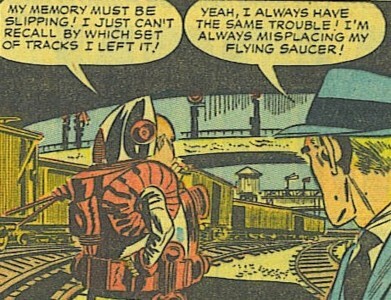 Remembering the "Moon-Man" claiming to have landed his atomic-powered "flying saucer" by the tracks, the reporter's curiosity was piqued, so he investigated further and checked public records to try to locate the self-proclaimed "Moon-Man," only to learn that there was no such place on Earth called the "Capel Sanitarium". This character was never named in this story, so I just identified him by the story's title. For some reason, the "Moon-Man" reminded me of actor William Frawley, best remembered as "Fred Mertz" from countless reruns of "I Love Lucy" (...and the psychiatrist reminded me of Larry Fine). The race of these aliens was never identified, but judging by their sanitarium's name, I'm guessing they may have come from the star Capella. Or, maybe they were "pink-skinned" Kree, and they temporarily had their sanitarium located in the Blue Area of the Moon. A reporter with the Daily Gazette, he was in Grand Central Station covering the train arrivals. When a seemingly eccentric man came into the station and claimed to have come from the he Moon, the reporter humored him and asked to see his "flying saucer," but after searching for it, the "Moon-Man" told him he couldn't remember where he left it. A cop came along and took the "Moon-Man" to a psychiatrist, and the reporter accompanied him. Later, the "Moon-Man" was taken into the custody of two men from the Capel Sanitarium. The next day, the reporter had put the incident out of his thoughts, but then he learned of a burned, mildly radioactive oval patch by the railroad tracks, which seemed to be evidence of the "Moon-Man's" spacecraft, so the reporter decided to investigate further. But after checking public records, the reporter learned that there was no such place on Earth called the Capel Sanitarium, and the disappearance of the "Moon-Man" would remain a mystery to him. A doctor of psychiatry, he was tasked with examining an eccentric man who claimed he was from the Moon. 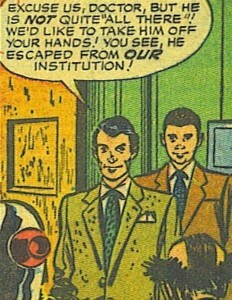 Although he found the "Moon-Man" to have a high intelligence, he thought his patient was obviously delusional. The psychiatrist later turned custody of the "Moon-Man" over to two attendants from the Capel Sanitarium, from which he had escaped. Two unidentified alien men, who were employed with the Capel Sanitarium on Earth's Moon. They were dispatched to recover an escapee from their institution. 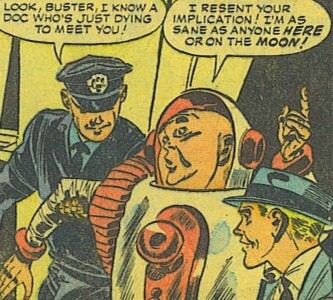 They tracked him down to Earth, and entered a psychiatrist's office to reclaim the "Moon-Man." When they returned their patient to the sanitarium, they scolded him for escaping, and told him he was still "unbalanced" and would require more treatment, because their people knew it wasn't time to travel to Earth yet. A treatment center for patients deemed to be "unbalanced," it was in an alien city that hovered over the landscape of Earth's Moon. The "Moon-Man" later drew a sketch of it when he was being examined by a psychiatrist. It was used by the "Moon-Man" to travel from Earth's Moon, and he landed it by some railroad tracks near Grand Central Station. When the "Moon-Man" later took a reporter to see it, he forgot exactly where he left it--presumably, it was recovered by the two Capel Sanitarium attendants who later took the "Moon-Man" into their custody. 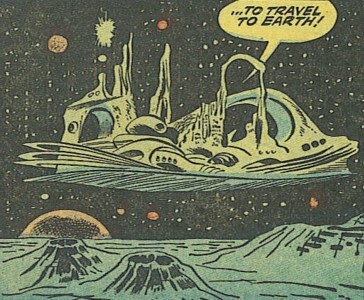 According to the "Moon-Man," it was the latest atomic-reactor type, and equipped with trans-space TV.